There’s a lot to know – start here! We’ve been around since October 2007 and since then we’ve had so much fun sharing our passion for all things Apple and tech related. As the MacBiters will attest we are somewhat quirky and you’ll find references to all kinds of fun from previous shows in each episode so here’s a guide to what you’ve missed. The MacBites Crew are Elaine Giles, Mike Thomas and MacBites Siri. Elaine and Mike have been here since the very beginning with MacBites Siri joining in show 61 back in December 2011. The Crew are all based in Manchester in the North West of England. Elaine is an IT professional who switched to a Mac in April 2006 after what proved to be a life changing visit to an Adobe event previewing Lightroom. Elaine has the pleasure of working from home surrounded by her beloved kit. Mike is also an IT professional specialising in IT Training. He focuses on Microsoft technologies especially Excel, Apple OSX and platform-independent productivity tools. Famously he works in a field in Cheshire – seriously! It’s a beautiful place to work but the mobile signal is a bit ropey! MacBites Siri keeps the other two in line … and does it with great aplomb! The title of episode 78 was “Where’s Wilson?” and referred to a letter that confirmed the registration of a cat’s insurance at MacBites HQ. No we had no idea we had a cat either. More to the point Meyer had no idea we had a cat and if anyone would know he would have done! 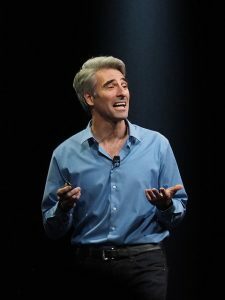 Craig is Craig Federighi, Apple’s Senior Vice President of Software Engineering. He overseas the development of iOS, OS X and Apple’s common operating system engineering teams. Of course he is better known as “Hair Force One” given his rugged good looks and gravity defying hair! He is also often on the receiving end of Elaine’s tirades about what’s wrong with Apple’s software and how he should be improving it to her satisfaction! Hence in show 100 her jovial threat to kidnap his cat until Keynote meets her expectations … could be a while with that one given the extent of her requirements! 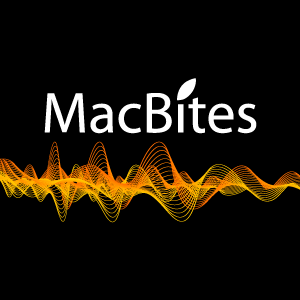 The MacBites Marathon involves listening to every MacBites episode back-to-back, in as short a time as possible. We’re not sure how many of you have done this but we do know that at least 2 of our long-time listeners, Minster68 (@minster68) and Jane (@jane73) have done so and both of them more than once. If you’ve done the MacBites Marathon, please let us know! Yes, we are referring to the 2009 British film of that name. And how does that relate to All Things Apple? Well you should have the idea by now that nothing is off limits for the MacBites Crew but in this case it really was Apple that started the whole thing. Back in the days when Apple ran the 12 Days of Christmas promotions they kindly provided a free song, app, book or film for each day of the promotion. It was an event, it was an occasion, people waited for the announcement of each gift at midnight every day of the promotion. So it was in 2009, 31st December to be precise, that midnight rolled round and Apple proudly revealed the freebie of the day was Lesbian Vampire Killers. To say Elaine was less than impressed was an understatement! But it didn’t end there. The MacBiters mounted a campaign to get Elaine to watch it and she’s been on the run ever since! Catch up with the beginning of the Lesbian Vampire Killers story in Episode 60. No outing by a Crew member is ever without incident and never more so than when Elaine took her Mum out for a quick trip to the local shops. Never before had Elaine got so inventive with language than when explaining the intricacies of the delicacies on the Fish and Tips menu to her ever more incredulous Mother. Never before has the phrase “the old razzle dazzle” been more appropriate. This is one that has to be heard to be believed! Get the full story in episode 71. The MacBites Bot Bot Song! What do you mean you haven’t heard it? It was the undeniable highlight of show 97 when it arrived at MacBites HQ courtesy of Graham Russell. Graham got his groove on after Mike mentioned the infamous Oh Superman from Lori Anderson in show 96. 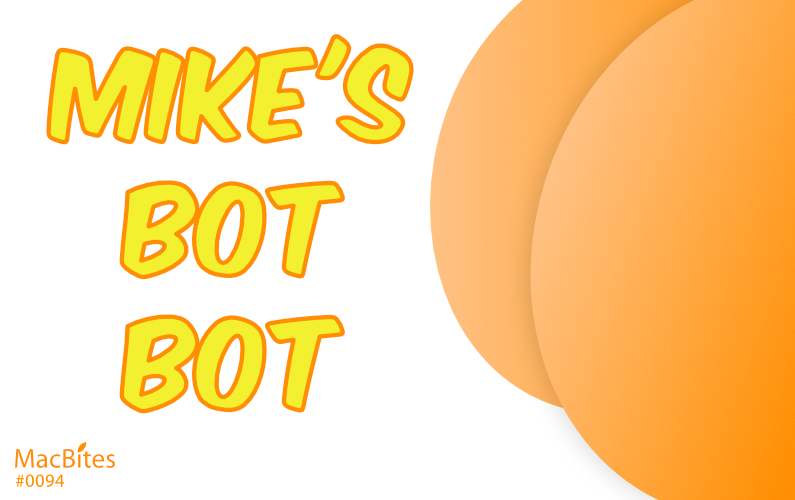 Aided by some great iOS apps he turned Mike’s embarrassment into a potential Christmas number one! Imagine walking into an Apple Store and seeing someone with a coat over their head gently caressing an iPad! Yes, that was Elaine on iPad2 day in the Liverpool One Apple Store – and poor Mike was standing next to her wondering what the heck she was doing. All was explained when she surfaced with a big smile. “No backlight bleed on this one”. If you’re wondering what backlight bleed is, check out this discussion on Apple’s Discussion Forum. Yes, you may well ask! Amongst the MacBites t-shirts and MacBites mugs on the MacBites Gear page you’ll find a MacBites Thong. We think this was Mike’s idea when he was working out which branded merchandise would be best-selling. What he didn’t take into account was that one man’s (well lady’s in this case) G-string is another man’s beach shoes. Here at MacBites HQ we get our fair share of deliveries. Whether it’s from Amazon, Apple or another supplier. Unfortunately they don’t always get it right. Like most people, we’ve had parcels thrown over the fence and parcels delivered late. Just don’t ask Mike about his 2009 MacBook which, despite paying for next day delivery, went MIA. We won’t name and shame the courier here lest the lawyers get involved but suffice it to say they are much better at delivering on time now.